Set your site on relaxing, and unplug with friends for great food and drinks at Palm Springs newest gathering spot, Grand Central. It was a long time coming for the opening of Grand Central at the historic La Plaza shopping center in downtown Palm Springs, which welcomed patrons recently this past May. The delay was understandable, as the space in La Plaza had been vacant for 12 years, and no doubt needed some extensive updating to transform it from the former Desmond’s department store, to a full-fledged restaurant. La Plaza was built in 1936 by one of Palm Springs women pioneers, Julia Carnell. Carnell was an Ohio snowbird who would visit Palm Springs in the winter months. After sometime of visiting Palm Springs, she grew weary of the lack of shopping and nightlife in the area and decided to do something about it. She essentially built the 3 ½ acre property so that there would be a place where visitors and locals alike could enjoy shopping, dining, dancing and comfortable accommodations. La Plaza was all inclusive, with 38 shops, 21 studio apartments, 8 penthouses, a theater, restaurants, nightclub, market, post office, drug store and many more amenities. Carnell had built one of the first shopping centers of its kind in Southern California. La Plaza eventually became a Class 1 Historical site, and is a precious part of Palm Springs. Although the accommodation side of the plaza is no longer available, it still thrives with a variety of shops and restaurants, and serves as a tourism magnet with its Spanish style architecture and romantic corridors. It is a true treasure. 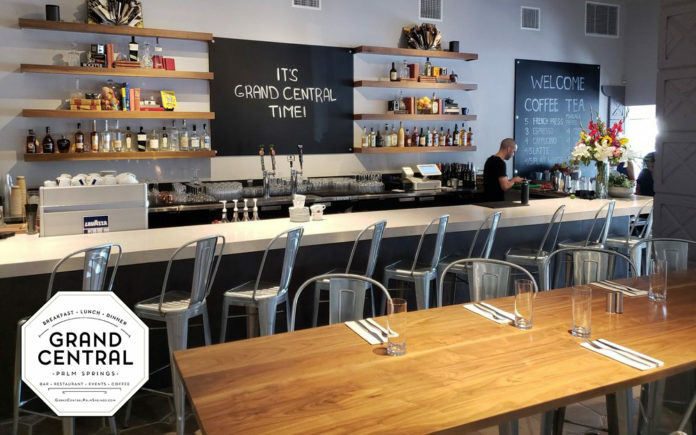 Grand Central has tapped into the historic integrity of La Plaza, embracing the collective relaxing essence, encouraging friendly gatherings, while reveling in great tastes and ambience. The dining spot is opened for breakfast and lunch and features a full bar. The original clock centers the restaurant and adds an endearing old time element. Guests can indulge in a range of creative menu selections including breakfast items such as, Savory French Toast ( parmesan brioche, citrus hollandaise, whipped goat cheese), Orange Ricotta Pancakes (orange yogurt dressing, whipped butter and fruit), and Morning BLT (Nueske bacon, heirloom tomato, lemon arugula, double yoke poached eggs, avocado dressing, served open on grilled sour dough), among other selections. Delectable lunch options include, The Desmond Burger (seared burger wrapped in prosciutto, beefsteak tomato, basil mayo, brioche bun and house cut fries), Grilled Cauliflower Steak (garlic crusted cauliflower, rich Pomodoro sauce and sweet potato gnocchi) and Watermelon Berry Gazpacho (garlic and pink peppercorn soup with a grilled baguette), plus other items. For dessert try some of the sweet parting flavors including Macarons (chocolate, raspberry, almond, lemon, espresso or pistachio) or Waffles & Gelato (waffles and caramel sea salt), as well as others. There are many things to enjoy about the Grand Central restaurant, from their exciting menu, to the rich history of their host building. It’s a perfect place to get wrapped up in all the things that Palm Springs is famous for, to relax and enjoy friends, great food and drinks. Julia would be proud.